As your resident Mistress of Magic I'd like to invite you to join me here on Kryptonian Warrior every Monday for my review or article of the week. Starting today! I'll still bring you the good stuff I find in the week but rest assured there will now be a weekly dose of your favorite magician! 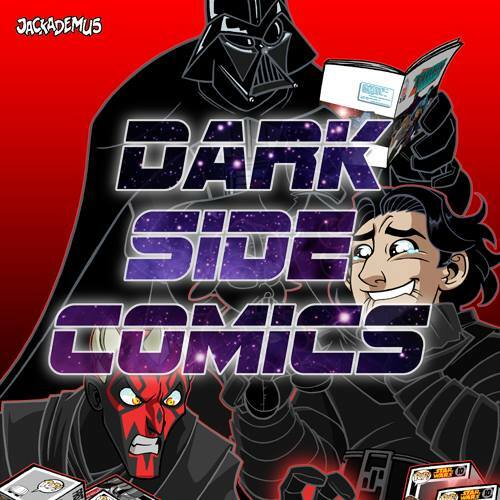 Now on with the review! 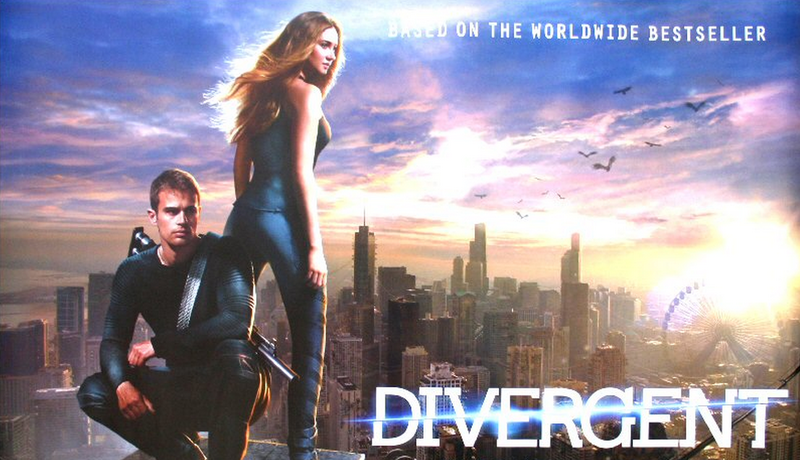 Divergent hit cinemas here in the UK on April 4th and as a huge fan of the books I've been super excited waiting for this moment to come and now it has finally arrived and after cringing and moaning through so many adaptions and "based on" movies and TV shows stemming from good books I think someone finally got it right! Being semi perfectionists and having a keen eye for detail as I'm sure most of us are (especially when it comes to shows, films, books and fandoms we love) we do seem to enjoy having a good moan about details left out, content added in, things that just weren't quite right and for the most part I think we tend to understand on some level at least that to make a film or a TV show from a book/comic isn't always as easy as just getting actors to act out every scene. It has to be the right pace to keep an audience interested, intriguing enough to encourage people outside the fandom to watch and explain enough that those new people can understand what's going on along side a million other things. Divergent balanced this his very well, pacing and explanation was good, not once did my husband have to ask me what was going on and the faction system was described really well, so much so that we easily had a very animated discussion afterwards about what factions we'd be in! 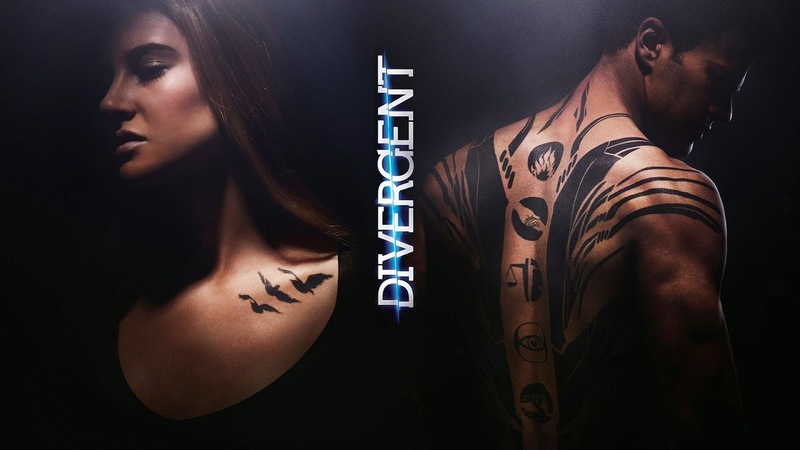 (Dauntless for him, Amity for me). There were (as with most film adaptations) a few things that weren't "quite right" but not things that were huge enough to affect the story in any big way, it all still made sense and you still got a good feel for most of the characters. I was very impressed that they even captured a lot of the happy group of friends scenes with Christina, Will and Al which I love and really help to break that part of the film up and stop it from becoming a training montage. There were a few scenes right at the end that did change, someone in a scene they shouldn't be for example and the way the simulation is stopped is quite different from the book but so very satisfying that I actually preferred it to the way it's done in book. So in my opinion they added good bits, changed a few of the longer slightly boring scenes around and compressed it into this really enjoyable 139 minutes of film. I couldn't be more pleased! It was especially nice to see a lot of the designs really come to life, I don't think the books really capture the size and scope of the city as well and seeing the futuristic and believable guns and clothes are something I really enjoy in a good film. I also wanted to mention that some of the acting in this film was superb! It's satisfying to see characters you know really come to life how you imagine them. 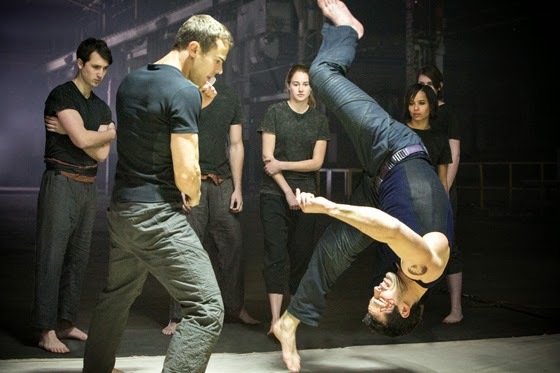 For me Jai Courtney as Eric was fantastic! He had the right mix of being a smart, calculating and hard as nails tough guy that made you a little scared of him. 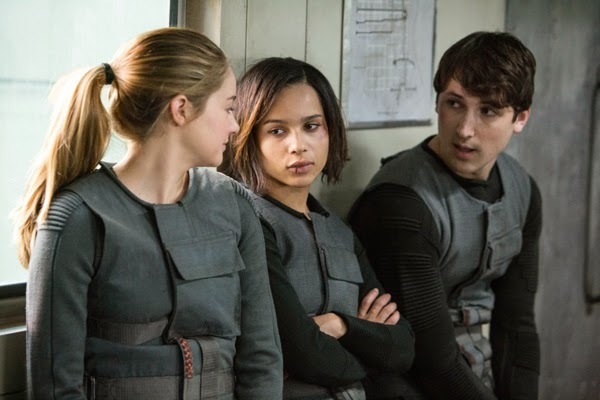 Zoe Kravitz as Christina was mouthy and stubborn (PURE Candor!) Ben Hughes as Will was the smart and kind side of Erudite, even Miles Teller portrayed Peter perfectly without a very instrumental scene to show us just how far he's willing to go to get what he wants, he still gets that across really well and you can really see the anger, jealousy and contempt for everyone in every little movement. 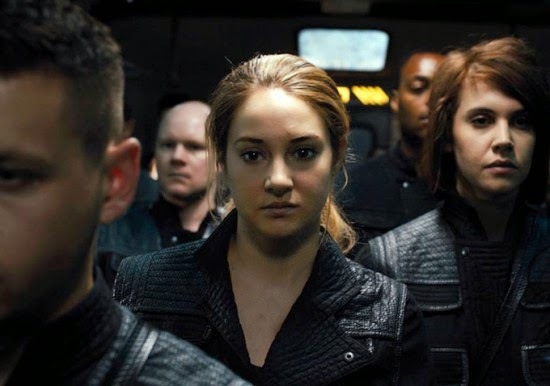 Shailene Woodley also brought Tris to life really well and did a spectacular job at showing who Tris really is, watching her change and grow which is so very important for this series of films and books. 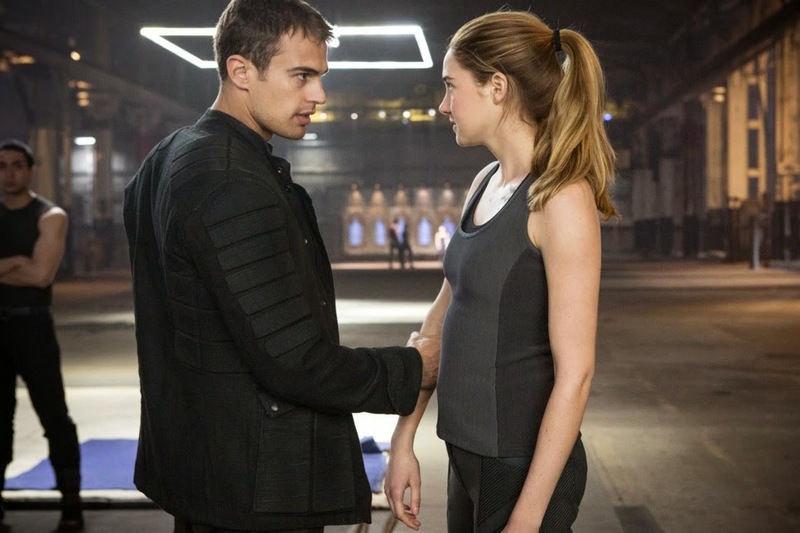 Then the two stars of the film for me were Kate Winslet as Jeannie Matthews and Theo James as Four. Winslet did more than bring Jeannine to life for me, she BECAME her, every little detail from the way she held herself, her facial expressions, the way she spoke that made you want to hang on every word she said. She completely embodied Jeannie Matthews for me. The same can also be said for James as Four. As my favorite character in the whole of the series I was really worried how they would pull him off, he's strong, he's tough, he's closed off and stern but vulnerable and intense all at the same time and you can really see all the emotions when he's not even saying anything, it's incredible. Like Four, when he does speak he demands respect amongst the other initiates but he can be kind and gentle as well. I won't go on too much more as I'm trying to keep this review as spoiler free as possible. 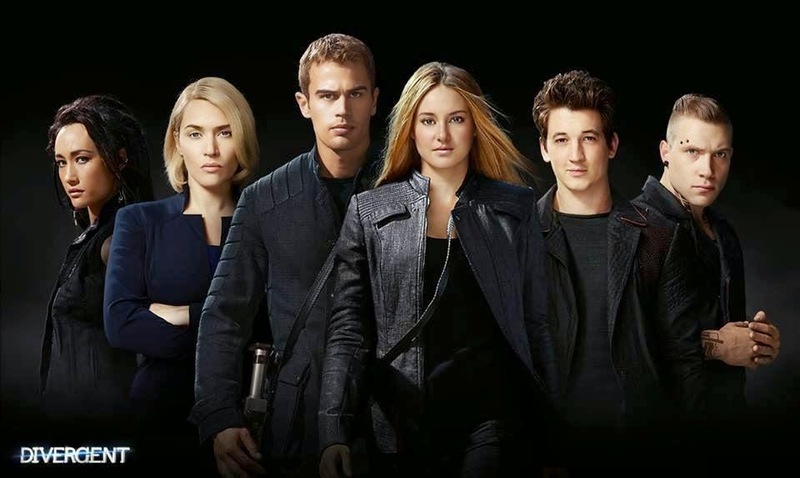 As a whole, I'm ecstatic with what they've done with the film, I'm a little hesitant to see what they'll do with the other films, especially as there are rumors of the third book (Allegiant) being split into two films (as seems to be the norm nowadays) and I'm not entirely sure it's feasible. I guess they did it with the Hobbit films but we'll see what happens.